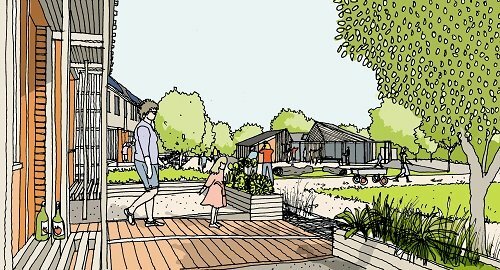 We are delighted to say that Bridport Cohousing’s Planning Application for phase 2 of the site was registered on 10th May 2017; this is for the 2+ acres that were not in the phase 1 planning application. The number of our application is WD/D/17/000534. The consultation period, during which members of the public are invited to send in their comments, started on 22nd May and ends on 12th June. LATE NEWS: The consultation period has now been extended to 30th June. We invite all our individual friends and the Friends of Bridport Cohousing to look at our plans and then email or write to the council to offer your comments in support. Cohousing is still unfamiliar to many people and the responses from supporters will demonstrate that it is a recognised way of living; with known benefits like careful husbanding and reduced use of resources such as energy and water, car ownership and use, but more walking and cycling which generates better health outcomes for residents. We had a fantastic response to our phase 1 application from residents and friends in Bridport, and we’d be delighted if you are also able to support this application. With thanks from the members of Bridport Cohousing.